One of our most loved invites, this card has been carefully hand assembled to ensure you are provided with a superior, sophisticated and classic creation. 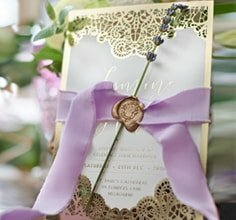 This striking invitation features a dainty floral pattern on the pocket using precise silk screening techniques with a lovely satin ribbon embellishment wrapped around it. 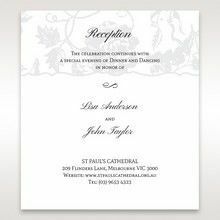 The advanced thermography printing provides a classic raised-ink effect for the wording that is framed by an elegant embossed border. 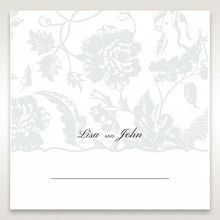 This is an ideal invite for any classic wedding that can be glammed up by having a foil stamped finish applied to your names or the entire wording at an additional cost. Such a timeless and elegant invitation. The paper used is of such high quality with the perfect amount of detailing. When I received them, i was shocked, they were much larger than I initially thought they would be given the price point. I really couldn't fault them, if you end up choosing these as your wedding Invitations, you will not be disappointed. Thank you for the speedy delivery time, only took 3 days! Wonderful invitation and envelope. 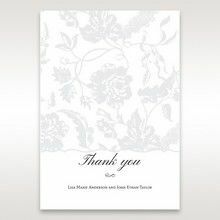 Simple but timelessly elegant.These gorgeous invitations would be a great choice for any wedding, be it formal or an intimate occasion at home.The stationary is classic and will be admired by all the guests that receive it. The ribbon is a beautiful addition that finishes the invitation off in a fabulous style.Every one that has seen these invitations has commented on their uniqueness. The design of this card is flawless. You can not ask for anything extra to be added to this design. It is not too large and not too small. It is elegant and classy. The only problem that some people might have is when you need to post them through mail in particular posting overseas. Other than that is a perfect wedding invitation card and the cost I guess is above average. the border on the actual writing can be in colour as well if some people fell it is too white. Also if we could have the RSVP part of the invitation on the back of the page it will be more use of the space and it wouldn't be too convoluted on the front page. You won't be disappointed, quality and service second to none. Our order was received on time and we were kept up to date by email of the progress of our order. 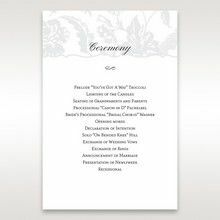 We were so impressed with the quality of our invitations and the prompt service; we will not hesitate to recommend Giant Invitations to our family and friends. We will definitely use Giant Invitations for any future special occasions, the choice and variety of invitations are endless covering all tastes and budgets. Their website is constantly updated with new choices ensuring they remain up to date with all the latest trends and fashions.Giant Invitations are great value, their website well structured and easy to navigate. The quality of their products will not leave you disappointed. I highly recommend Giant Invitations and cannot say enough about their professionalism, prompt service and quality products. This is a very elegant invitation. It's embossed paper gives a beautiful finish to the pocket. The ribbon adds dimension and would be nice if the ribbon could be provided in other colours. 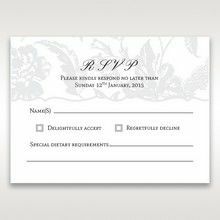 The pocket provides ample space for additional cards such as RSVP. The matching envelopes have a special appearance and would be noted when arriving in the post. 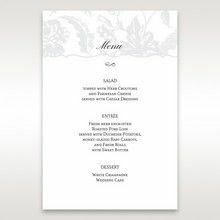 They could also be used as matching menu cards at a dining reception. Lovely selection of invitations to chose from. The samples were easy to order and delivery time was very efficient and reliable. I found the online chat very helpful and all questions were answered instantly. The invitations are of beautiful quality and I am looking forward to receiving the final product. I would definitely recommend this website to all in search of the perfect invitation. Thank you. We love these invitations! They are so pretty and detailed. The paper is of amazing quality and thickness, and we have received so many compliments for them! Beautiful package to send out to guests. The shipping was really fast too. We are so happy that we chose to go with Giant Invitations. Great experience navigating through the website. We were very excited when the samples arrived. I ordered 10 because it was too difficult to make up my mind as they are such a beautiful wedding invitations. During our weekly family dinner we enjoed reviewing the invitations and we all agree with the chosen one. 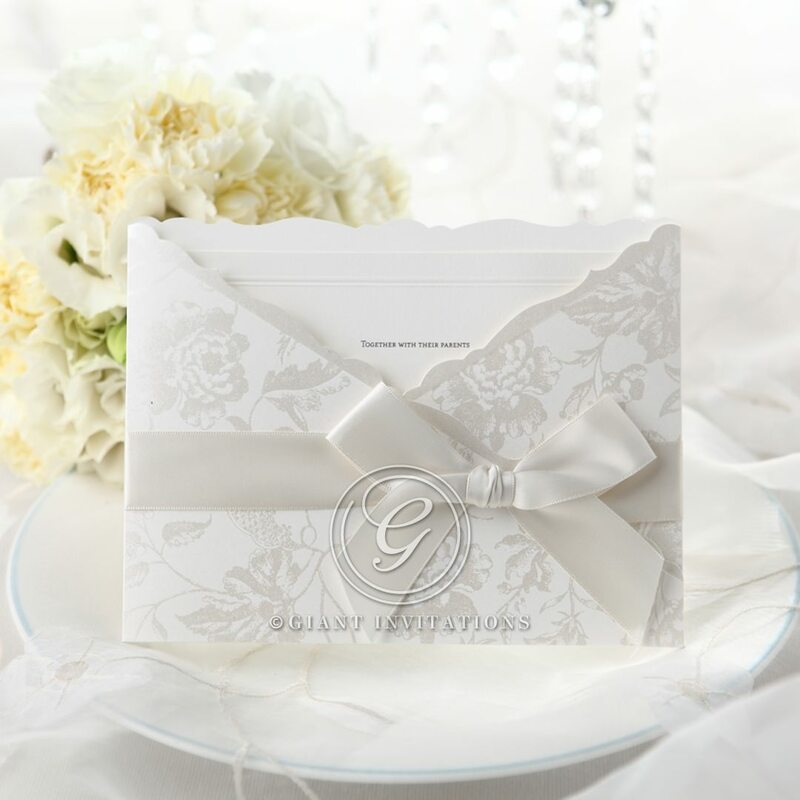 It is a beautiful and elegant wedding invitation. The proces of ordering was made easy by having some one to talk on line and by the phone as well the staff were very professional and helpful. 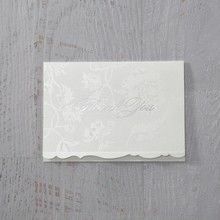 I have ordered this invitation as it is simple and elegant which was very hard to find anywhere else. The service from the staff has been excellent and they were only too willing to assist me with enhancements and give me advice. If I encountered any problems along the way, staff were easily contactable. I was surprised how easy it was to customise the invitation to me our needs. I can't wait to see the finish product. I ordered this sample for my daughter to view for her upcoming wedding in October and she was absolutely delighted with this invitation. Absolutely stunning and gorgeous. Definitely very elegant and the matching set was also delightful. 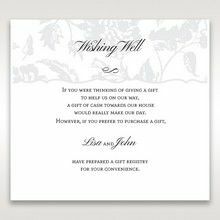 are now putting in our order for this absolutely gorgeous invitation and matching RSVP card and Wishing Well/Gift Registry card. fact that it also comes with top quality envelopes and little pocket for Wishing well card is an added bonus. We have our wedding in August along with 5 other invitations as Samples. The arrived quite quickly and all the invitations were great. This one in particular was quite good. The flowers on the pocket were shimmery and nice, the bow on the outside of the invitation was also good quality. The card itself in simple however the embossing was very pretty and exactly what I was after. All in all a very good card. Absolutely stunning and elegant perfect for a wedding. Great product, good quality paper. Very prompt service. Of the sample invitations we ordered, we both agreed this was the standout design. It sets the right tone for a wedding. It looks amazing and so I love that it has a beautify designed pocket and the invitation is really nice as well. Love it. This invite is gorgeous. 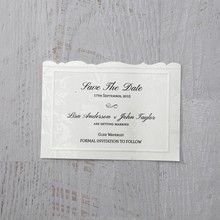 It looks lovely, and is easy to access the actual invitation by slipping it out of the little pocket. elegant and timeless. we have had so many compliments from our guests about our invites. They were shipped quickly and they arrived in perfect condition. Beautiful invitation. Definitely on our short list from the samples we ordered. I ordered the sample along with others and this was my favourite. Really nice quality for the price too. The quality of these invitations were better than I expected. I'm really happy with the samples that I received. I bought some invitations for my parents Anniversary, thank you so very much, they were just so beautiful. I have had so many comments about them ranging from beautiful to stunning. When I opened the package everything was just perfect. Thank you once again. Extremely happy with the invites. They were made with extreme care, and they are classy and elegant. We have received so many compliments and will definitely recommend Giant invitations to our friends. We were very happy with the samples we received, they are excellent quality invitations! My fiancé and I couldn't be happier with our wedding invites. They are beautiful and so professional. I will definitely be recommending your website to everyone especially my engaged friends. Just received our enchanted floral pocket invitations. Beautiful and exactly like the sample however we also bought the matching wishing well cards and these did not match despite both stating a silver grey theme and being listed as a matching item. We decided to go with giant for the wishing well cards to ensure they matched the invitations, otherwise we could have gone elsewhere for a lower price and same quality. Disappointed that the 'matching item' does not match as the invitation itself is gorgeous. 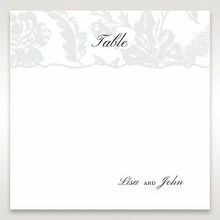 Elegant, beautiful and simple invitation card. The invitations arrived as expected aside from the actual product ribbons differing from that on the sample product and the envelopes not being those ordered. I was quite happy with the product quality overall but found requesting any changes was little bit complicated. received a sample - fell in love with this design. Will definitely be ordering these invitations. The invitations arrived and they look fantastic! Thank you! I absolutely love them. They are exactly what I wanted: beautiful and elegant. I have already received comments about them from our wedding guests. We loved the invites, they were perfect! I thank you for all your help throughout the process. It was a pleasure doing business with you! Beautiful Invitations, fast turnaround and very professional. I was very happy with the chat icon as I could get my questions answered straight away, instead of waiting days for a reply from a email.I ordered the 5 samples and was very happy with the efficiency of the delivery, and the quality of the invitations.I would recommend this site to others. Thank you Giant Invitations. I ordered a selection of samples which was really helpful in selecting the final invitation for our wedding. We loved the quality and sophistication of the Enchanted Floral Pocket. It's a beautiful invite. Received a sample of this invitation and we all loved it. Great company with makes people happy with their amazing invitations. I order invitations to my brother wedding on Bulgarian language and after 8 days the invitations was in Bulgaria. But the most important when I received the invitations, was the smiling faces on my brother and his future wife.Thank you for everything and go on to make peoples happy. 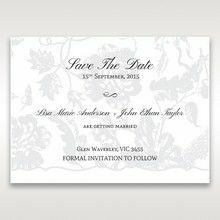 We sent out our wedding invites recently and have received great comments back... everyone has said they look fantastic. Received a sample of this invitation and we all loved it. Definitely our wedding invitation! Ordered samples they came the next day! Very fast we loved the samples. Waiting on confirmation on venue then will be ordering. Very simple and the best price for good quality invites. The invitations looked absolutely amazing! It was really easy to personalise and order and it was quick to arrive! They're absolutely beautiful! Thank you so much! The invitations look fantastic! All samples ordered were fabulous. Super easy to order and the samples arrived very quickly. I can't wait to receive the real invitations! We order five samples and it only took a few days to for them to arrive...All the samples looked great, but we both picked the same one invite and can't wait to send them out to our friends and family. We absolutely LOVE our invitations! They are beautiful and the whole process was really easy and fun and exciting. Thank you so much! 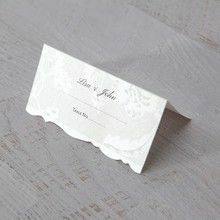 The wedding invitations, envelopes, RSVP cards and Wishing well cards are all beautiful. We couldn't be happier with them. The invites came yesterday and we are SO happy with them. They look stunning and are really well made - so simple and elegant! I am so happy that we found Giant invitations. We orginally were looking at an american company, for the price. However, I came across Giant invitaions via a friend on facebook and immediately fell in love with your invitations. It actually was really hard to choose an invite because I liked so many. The price is really affordable and the product is high quality. The invitations arrived today and I cried when I saw them as they were more beautiful than I imagined!It's just so real to see my name printed on them!! Thank you. I would love to be featured in your wedding section but will have to be after November this year!! We received our samples in record time and we loved all of them!!! Exactly what we were looking and so much more!!! Thank you!! The samples I requested arrived within a few days and I loved them. I showed my fiance and my family and we agreed on a favourite. We are just finalising the wording and hopefully will be placing an order for the invitations within the week. 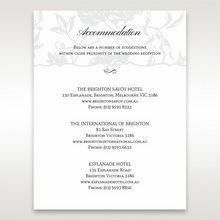 I was so pleased to find this website as the invitations are so elegant compared to so many others I had looked at. I'm also happy to be supporting a local business. Lovely invitations! Arrived very quickly!!! One less thing to worry about and organise!!! Thank you guys!!! the service and support from giant invitations was exceptional. they were friendly and always willing to help. the product itself was perfect and all of my family and friends commented on how beautiful my invitations were. The samples I received arrived quickly. I then placed an order for my invites. The invites were amazing. Everybody thought they were beautiful. I have referred friends to this website. The customer service was also great. VERY excited to buy our invitations through you guys! The samples were beautiful! Now I just have to decide! The sample we received was delivered promptly and look beautiful. Will be using them for sure. Beautiful product and quick service. From the moment we received a sample of this invitation, we knew it was the one for us, it was Perfect. Classy, Elegant and it was exactly what we were after. 100% quality, You wont be disappointed. Today I received my very pretty invitations that I ordered from your website. I just wanted to let you know how perfect they are. Thanks so much. Fantastic quality invitations, we got more for our money ordering online with Giant Invitations then we would had we chosen to go with a local store.